During the 1930’s, as America struggled with the Great Depression, Virginia created a public works project to document historical structures across the state. Louise B. Weisiger visited Powhatan County and on August 19, 1937, submitted a report describing Traveler’s Rest to the WPA of Virginia Historical Inventory. She interviewed local residents, searched deeds at the courthouse, visited the home and even took a photograph. Ms. Weisiger’s report is located at the Library of Virginia. Based on this report and other evidence I believe Travelers’ Rest was the home of my fifth great grandfather, Robert Taylor. Drive down Bell Road from Provost towards Route 60. Just a short distance from Provost on your right is a dirt lane. Pull into the dirt lane and the dilapidated dwelling there is most likely the home Ms. Weisiger described as Traveler’s Rest. Margaret Palmore, now deceased, the owner of Provost, was a caretaker of the property and she graciously gave me permission to enter the home several years ago. The property had been owned by Samuel Palmore, her husband’s father. He acquired the property in 1915 and thought it could date back to before 1750. Mrs. Palmore said it was empty when the Palmores owned it and that her husband told tales of local teens using the house for parties. Some things never change! The Palmores sold the house in 1932 to Leo Carpenter and his heirs remain the owners of the property. Mr. Carpenter enclosed the porch and added a second story for his large family. Compare the two photos: the right hand porch of the Weisiger photo is the enclosed porch of the top photo. A new entry was added to the right side of the enclosed porch and a second story. This is compelling evidence but the most exciting discovery is inside the house. Central interior chimneys like the one described by Ms. Weisiger are not commonly found in surviving colonial Virginia homes. Generally the chimney is on an outside wall and there are frequently two at opposite ends of the home. This could have been to prevent the spread of fire, it may have been cooler for hot southern summers and it may have been adapted from building practices brought by English immigrants. The Powhatan dwelling I visited has the central chimney and four fireplaces exactly as described by Ms. Weisiger. Two had late addition brickwork and two were blocked off. There are also very old six panel doors and a beautiful arched doorway. Sketch of Robert Taylor’s home for his Mutual Assurance policy in 1802. The policy is held at the Library of Virginia. Much like today’s homeowners, Robert Taylor insured his home against fire damage. The policy with the Mutual Assurance Society of Virginia was signed by Robert Taylor. who resided at Taylor’s Seat in Powhatan County, on September 30, 1802 and insured his dwelling and barn for $1200.00, a large sum in 1802. The house is described as a wooden dwelling, one story high, 40×26, underpinned with brick. 200 yards from the house is a wooden barn, 20×20 feet with a shed all round in 40×40 feet. There’s even a sketch of the house and barn. Robert Taylor reduced the value of his property to $1150 when he renewed the policy on June 22, 1805. The house was described the same, but slightly smaller at 36×26. The barn is 150 yards from any house with the same dimensions as 1802. The drawing shows an adjacent wooden kitchen and smoke house. In 1820 Robert Taylor declares his residence to be worth only $750.00. This sketch of Edmund Toney’s home is part of his 1802 Powhatan County Mutual Assurance policy. View the policy at the Library of Virginia. I looked at all of the property insured in Powhatan County in 1802 and most have detailed drawings of the dwelling. Most show homes with chimneys on the end like the Toney home pictured here valued at $850 with two barns. Edmund Toney was Robert Taylor’s neighbor. The detailed drawing and description made for Robert Taylor’s home is consistent with the Travelers’ Rest photo and description. While there is a slight discrepancy in building measurements between policies, it is likely the same dwelling. Robert called his home Taylor’s Seat in the 1802 policy but did not specify a name in later policies. House names can change over the years and Travelers’ Rest may have been a later name. The little house is sited on John Taylor’s original 400 acre land purchase in 1737. More importantly it is also part of a gift of 100 acres John Taylor made to his brother William in 1742, the same tract William transferred to his son Robert Taylor in 1765 and 1771. Researcher Ann K. Blomquist documents the location of the parcels on page 19 of her book, Taylors and Tates of the South. Robert may well have lived in this house his entire life. When Robert Taylor died 1n 1826 he left a will (Powhatan County, Will Book 7, page 307) detailing the distribution of his assets including the property where he was residing. “I lend unto my daughter in law Polley J. Taylor widow of my son Charles Taylor deceased during her natural life the remaining part of the plantation whereon I now live lying on the West side of the said Courthouse road on which is situated my mansion house and is bounded on the North by the lands of Gater Clark, on the West by Blagrave Taylor on the south by the lands of the estate of John Swann Junior dcsc and on the East by the land above mentioned as given to my son Daniel…” Robert further specifies that since Polley was pregnant, the property should be divided between her son Blagrave and the unborn child if the child was a son. Tracing the home’s history, it is important to note that Robert Taylor’s oldest son, Blagrave (my fourth great-grandfather) did not receive any land in Robert’s will. Robert was very specific in this regard as he had already given Blagrave acreage. The Blagrave receiving the property in the will was Robert’s grandson. “Robert Taylor was a successful farmer and owned many acres of land. To his son Blagrave, he gave Travelers’ Rest. “Blagrave Taylor had a shoe shop and made shoes before the war between the states. One pair of shoes are now in the possession of Mrs. A. P. Jenkins, Powhatan, Virginia. Mr. Taylor also made wooden spectacle frames. One pair was given to Dr. R.D. Tucker and are now in possession of Mrs. R.D. Tucker, Powhatan, Virginia. He trained for duty in the war between the states in Major W.S. Dance’s Battery, but died before he saw actual service. His wife, Amanda Taylor, had quite a hard time (as many others did). She had to sell her carriage and go to church in a wagon. She also spun thread and wove the cloth to make suits to sell to Mrs. George Cocke, Bellmeade, Virginia. “Mrs. Cocke wanted to adopt the youngest child of the Taylor family, but Mrs. Taylor would not give her consent. Shortly afterwards, the child died. With the exception of the confused identity of Blagrave Taylor, much of this report is factual. Blagrave Taylor married Amanda Ligon on November 4, 1850 in Powhatan County. His obituary was published in the Religious Herald on April 25, 1861. The wealthy Cocke family lived nearby at Belmeade and it is entirely possible that Amanda Taylor did weaving to support her family after the death of her husband. Daughter Annabelle Marvel Taylor, born in 1856, is reported to have died during the war, so this may be the child Mrs. Cocke offered to adopt. Dr. R.D. Tucker, referred to in the report as owning the spectacles was Dr. Robert Daniel Tucker. His great-grandfather was Robert Taylor and his grandfather was Robert’s son, Daniel Taylor. The informant Mrs. Charles Baughn (Lois Palmore Baughn) was a granddaughter of Blagrave and Amanda Taylor. Grace Truman Howard, granddaughter of Blagrave and Amanda Taylor, married John William Jenkins and she may be the Jenkins informant for the report. She was a postmaster in Powhatan County and would be a likely source. These family connections lend great credibility to the Weisiger report. The property was registered as the estate of Blagrave Taylor in the Powhatan County Land Books for many years and son Oswald Blagrave Taylor sold the property in 1915 to Samuel Palmore. 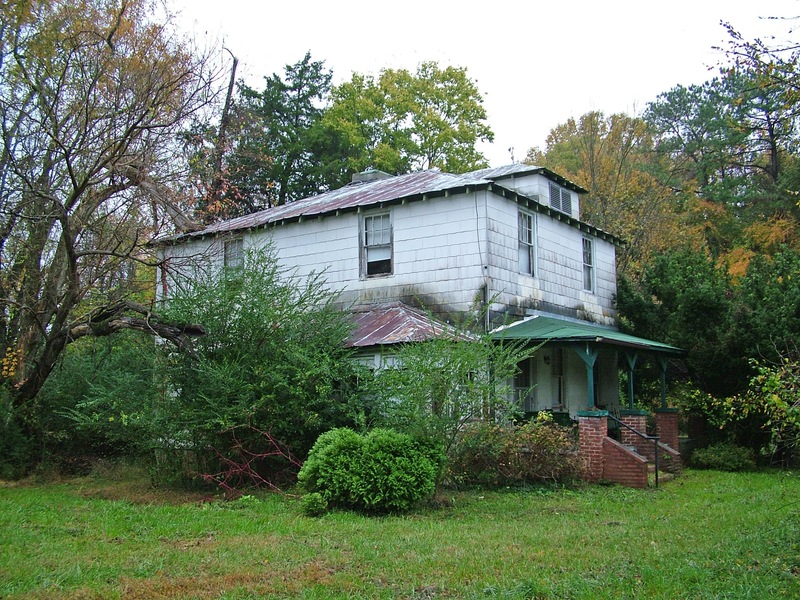 Today the property is parcel 014-41, registered in the name of Leo H. Carpenter at 4791 Bell Road in Powhatan. The property record and a map may be accessed at http://www.powhatanva.gov and includes this property sketch and a photo. Note that the house dimensions are remarkably similar to those recorded on Robert Taylor’s Mutual Assurance records. 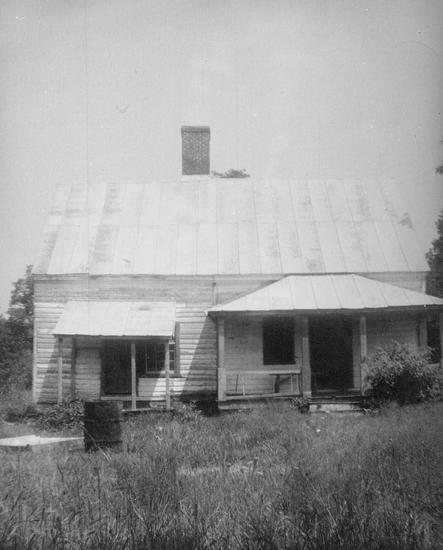 This post makes the case that the home at 4791 Bell Road is the same home described by Louise B. Weisiger on August 19, 1937, as Travelers’ Rest for the WPA of Virginia Historical Inventory. However, in the book Powhatan Pathways by Margaret Palmore and John M. Kerr they state that Robert Taylor built his home, Taylor’s Seat, on the site across from Provost where Rosemont is presently located. Historic maps of the area also note Taylor residences on that location but I believe Daniel Taylor was left the property on the east side of Bell Road and grandson Blagrave Taylor the property on the west side of Bell Rd, including, as specified in his will, the property where Robert Taylor resided. The interior chimney described in the Weisiger report is a remarkable feature and correlates closely with the home at 4791 Bell Road. I doubt if there were two properties with this unusual chimney configuration in the neighborhood. The Historical Inventory map places the property (175) on the east side of Bell Road at the location of Rosemont. This must be an error because in 1937 Rosemont occupied that land. Weisiger’s report sites the property at “.1 mile east of Provost, Virginia on route #16, thence .1 mile west on private road.” This description is closer to the location of 4791 Bell Road than the the “175” depicted on the Historical Inventory Map (Library of Virginia) depicted here. Have I made the case for Robert Taylor’s home? I welcome your thoughts. Posted in Powhatan County, Taylor	provost taylor "robert taylor" "powhatan county" "travelers rest"
Omg. This is totally awesome. Just when I think I’ve got alot of information, this work you have done blows me away. Thank you for sharing! I’m going to read through again so it’ll sink in. Thank you Robin. I hope the posts help guide your visit to Powhatan.